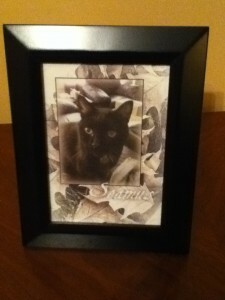 Beautiful pet photos are a wonderful way to save you or your loved ones favorite photo into a lasting keepsake. Our designs make thoughtful gifts. Here is a recent example of ‘Seamus’ that was done. Click the image for a larger view. Why choose a design from us? Your photo is digitally and artistically designed. Your photo is cropped to get the best view. Your photo is processed professionally with unique backgrounds to set it off. Your photo is edited to take out “pet eye” which is the white from a camera flash and the colors are brightened. Please email your photo to bilterben@cox.net and in the subject include pet name and any other info you wish on your design. A proof will be emailed to you for your approval before finalizing and printing. The final product fits in a 5 x 7 frame (not included). Prices starting at $60.00. Please email us for a quote.